You may have been here last week when I talked a big game about getting a lot done for KCWC this year because my kids are in Florida for the whole week. As is turns out, there are so many more fun things to do besides sew when your kids are gone and you can do whatever you want. Who knew? Also, I have a job and playoff tickets and episodes of SYTYCD to catch up on. Priorities people. Even so, I've managed to make 2 items for Elsie in these first three days. For the rest of the week, I think I just need to continue down this path of following simple patterns I've made before. I also need to continue down the path of not caring if I miss a day. There is surely post-Reds-win beer to be had tonight, not more sewing. 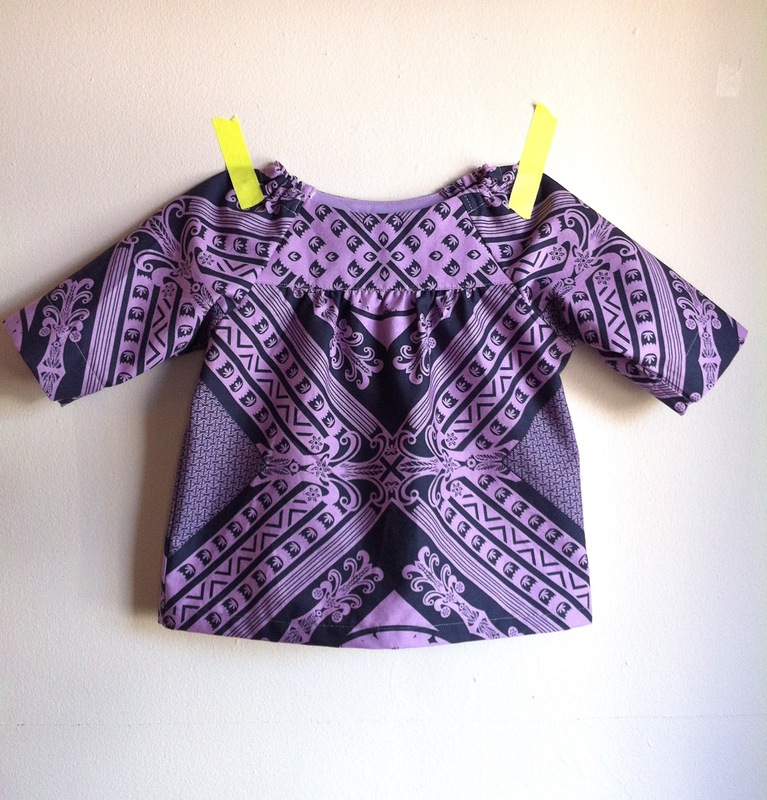 Notes: A simple sew, just like the first time. Really had to squeeze in some fussiness when cutting this print though, and I love the effect. I promise the panel in the front is more centered than it looks here. 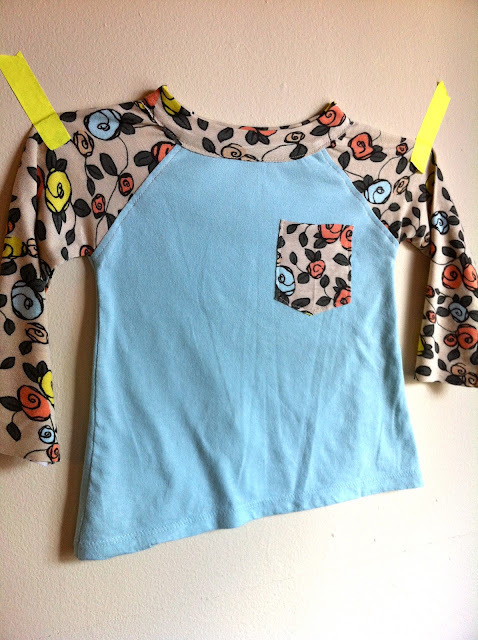 Notes: I've used the Raglan pattern from this book a lot, but it doesn't come in a size small enough for Elsie, so I modified this romper pattern to be a long sleeve tee. And I added the pocket, which is slightly crooked, but doesn't this side angle shot hide that well? I really love this funky knit I found in the clearance section. It's by April Johnston from PR a few seasons back. Wouldn't these look so much cuter on my little model? Despite all the grown-up basebally fun we are having, I miss my kids terribly. The couple in front of us at the game last night had the sweetest baby girl and I couldn't stop staring at her. It was all I could do to not ask them to let me hold her. That probably (definitely) would have been inappropriate, but I almost didn't care. Almost. That fussy cutting is splendid. Best use of that fabric evAR! you probably need to go buy a puppy or a bunny rabbit or something to mother while they're gone. maybe a cat. you love cats. Love both of these. Nice fabrics on both! The Class Picnic Blouse pattern is sitting on my cutting table right now. It's definitely on the agenda for tomorrow's nap time after seeing how cute yours turned out. Adorable Jessica!! I'm glad you're having so much fun! I am way less motivated to "get er done" when the kids are gone. I always dreamed that if I just had alone time, I could get so much more done -- nope! never happens. Wait until they are in school and your home alone all day -- it's lonely and weird! Wha??? No kids?! Lucky duck! I'm really liking the Picnic blouse. SO cute! they are both so cute jessica! sorry you miss your kids so much, they have to be home soon right?